After the success of Sliding on Hover Jquery Featured Post Slider For Blogger and as per your request we are really delighted to present you yet another dynamic version of image slider widget for blogger blogspot blogs. This image slider is totally different as it is well optimized and hence the speed of this image slider is comparatively faster. Another great feature of this widget is that you can also use it as your Featured post widget which makes it Two in One. This widget is exactly coded from WordPress themes. The Slider is optimizing really well that it will only appear on your home page. 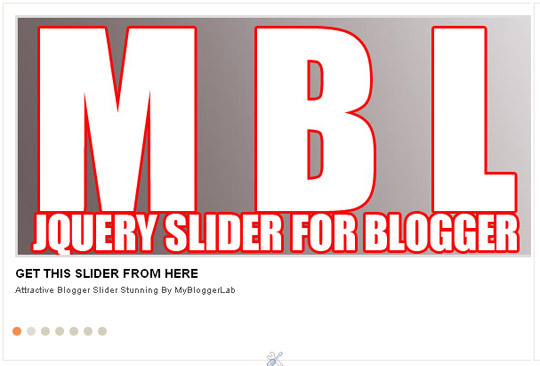 To insert slider in your blog do as follows. Now we will insert Style sheet CSS in blogger template. Now Search for ]]></b:skin> and just above it paste the following code. Now After pasting the style sheet code simply press Save Template. Now we will insert the Slider in our blogger template. To customize your widget do as follows. Now after personalizing your slider save your template by pressing Save Template button. If you face any problem during the implementation of this widget feel free to ask. Just leave your comment below and I will try my best to resolve your problem. Till then peace, blessings and happy optimizing. very nice post.. do you have any demo from this? one thing to ask how did you put a + sign your related post? any tutorial? But why cant I find wrapper? Anyways I will try it..
Bro one more thing it would be nice if you upload Jquery in pastebin or g code. I have a lot of questions Faizan, kindly give me your email address. Is is possible to delete the "dots" for navigation, to give it a completely clean look? Please help!! What do I do if I cannot find either of the wrappers? I have downloaded the code from Mediafire and from Jquery directly. Now what do I do? I really want to add this to my blog. Thanks!! Oh Don't Worry If you cannot handle it Please Send us your Blogger Template @ contact.mybloggerlab.com in XML Format we will handle the Rest.! Everything works fine when I add the first set of images to each slide, but when I try to add a new image to a slide it doesn't show up. Don't know why this is. I Think you are not inserting images correctly! I want to add this in my blog. These Two Keywords <div id='main-wrapper' & <div id='content-wrapper' are Not Exist in the Template. I think Google has changed their Html Tags, so you should update your tutorial accordingly. div id='main-wrapper' is not in my template. My blog url is www.thesneakerreserve.com. Please help. Thank you so much. salaam syed...... I want please the right to left image slider code . like the one in Johny Sompret Banget Blogger Template. this is the web site for that template. like the one in Johny Sompret Banget Blogger Template. Ok Soon we will Share its Coding. Stay Tuned! Check out out Latest Article on Home Page About "Drop Down Menu" << thats what we call navigation. in Johny Sompret Banget Blogger Template. I Think you haven't inserted the images correctly. That could be the only reason why it is not working. salaam syed....... i didn't hear from you as you promised..... any way i started a new blog where the slider image in the header moves from right to left......so how can i make it please move from left to right? Sorry Dude, this week was very busy thats why we were unable to answer your question. Peace. You are a lifesaver! I’ve been looking everywhere for this, and am I excited! It works perfectly! Thank you so much for this awesome tutorial!